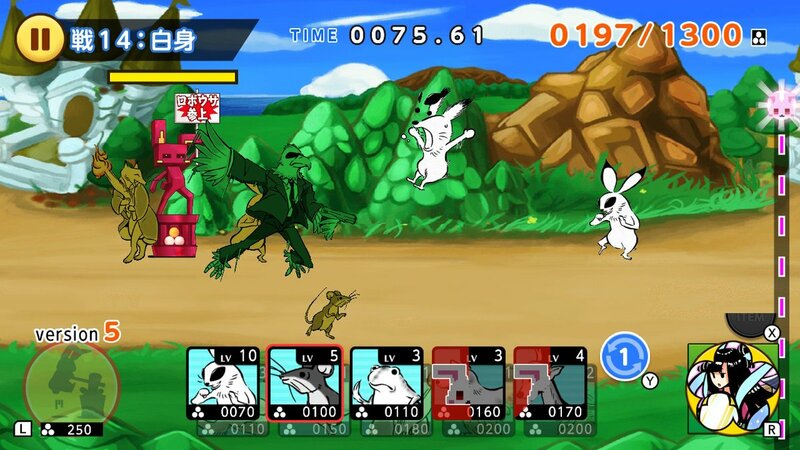 Chōjū Giga Wars is a game that's available on the Japanese Nintendo Switch eShop. It's not going to be released in the west - I'd bet money on that. But it will only set you back 700 yen - less than $10 - so go find an online retailer that sells Japanese eShop credit (you could even support DDNet and get one from Play Asia using this link to provide us some affiliate revenue, if you'd like), and play it, because if you enjoy Japanese art and culture, this game is a brilliant homage and satire to all that good stuff. The below couple of paragraphs is going to get a bit dense and educational... so sorry about that, but it's a big part of why I both love the game and find it so amusing, and it really does help in understanding everything that Chōjū Giga Wars stands for. So Chōjū Giga Wars is based on what is generally credited to be the first manga; Chōjū-jinbutsu-giga, a 12th or 13th century scroll painting that was owned by Kōzan-ji temple in Kyoto (you can now see it in either the National Museum of Kyoto or National Museum of Tokyo), and likely created by an artist monk, Toba Sōjō. Loosely translated, it means Scrolls of Frolicking Animals, and the painting depicts just that; anthropomorphised rabbits and monkeys and frogs getting up to all kinds of mischief. It has a very distinctive art work to look at, featuring the monochrome ink brush techniques that has been a major part of the Japanese aesthetic over all this time, and has been a major source of inspiration for untold numbers of artists. Chōjū Giga Wars' Japanese title actually uses different kanji (超獣ギガ大戦) to the painting to create a different meaning, which I would roughly translate to Super Animal Powered Big War. As the name suggests, this game is not exactly a serious homage to that classic painting, taking the monochrome aesthetic of the animals as seen in the painting, and then pitching them into a casual strategy game. But wait! There's even more traditional culture and storytelling irreverently packed into this game! The first thing you'll notice is just how loaded it all is with rabbits. They're the first unit you control (and therefore the weakest, but you'll be using them an awful lot, because they're also the cheapest and therefore most useful), but those aren't the only bunnies you'll see; when you glance at the icon that represents your forces working hard to generate money, you'll also see a rabbit silhouette taking a hammer to a bucket, which represents the process that was traditionally used to create rice cakes (which are the currency that you use in battle to create units). Then there's the game's main theme, which is about Orihime. Orihime (not to be confused with the character from Bleach), is a woman from the stars, separated by the Milky Way from her lover, and the two only get to meet once per year. That date is the Tanabata festival in Japan (the exact same story is celebrated in China and Korea under different names... and indeed the story itself was originally a Chinese tale). So it's a big day on the Japanese calendar (particularly for the people in Sendai), and it's all about deities from the stars. Orihime herself is represented in Chōjū Giga Wars as being the woman's face that you see representing your castle - or base - that you need to protect. The point to all of this is, of course, that Chōjū Giga Wars appropriates an awful lot of traditional Japanese culture, art, and storytelling in order to create the frame for its action. What all appears to be rather random on the surface to our gaijin eyes does indeed have a reason to be there, and while the game is definitely aiming for humour and nonsense fun, it does so in the best possible way; by not being genuinely random. The best satire and humour has a grounding in reality, and people who do understand all the visual and narrative cues and themes through Chōjū Giga Wars will really get a kick from how it's all depicted in this game. Mechanically, it plays out much like games such as the excellent Battle Cats - which is available in English on mobile devices and the 3DS if you're keen to see it in action for yourself. Resources are generated automatically - that's the rice cakes I mention earlier - and when you can afford a unit (each one costs different amounts, and has different strengths and weaknesses), you simply pay for it and it will automatically make its way over to the enemy base and attack it. If they run into an enemy coming from the other direction, the two will fight, and once one of them has been defeated, the other will resume their march forwards. Whichever base gets destroyed first loses, so winning in Chōjū Giga Wars really just involves building more powerful units more quickly than your opponent. Between battles you can use in-game cash to level up your base and units, and this is of course necessary as the enemies get consistently more difficult. 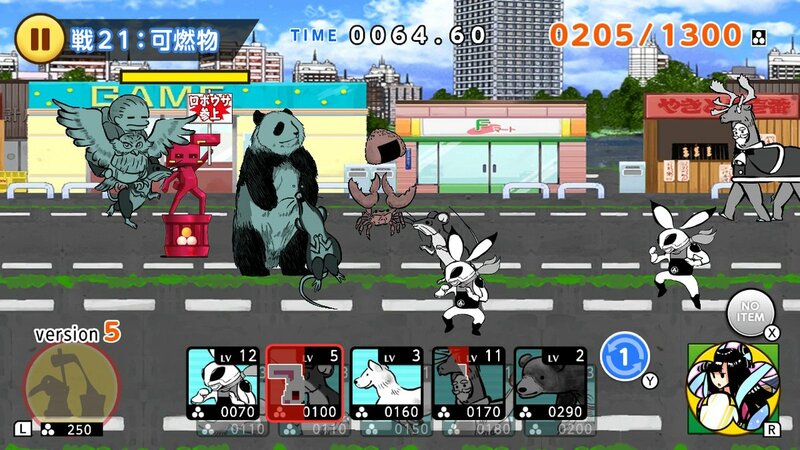 On mobile this game would be a mess of microtransations and gacha, but as a "full price" game on console there's none of that; new characters unlock regularly, and while you'll need to grind a bit to level them all up, it's almost too easy to stay ahead of the animal challenge curve. The game plays well enough. It's very casual and hardly the kind of gameplay that you'll be raving about for decades, but it's quality, light entertainment. 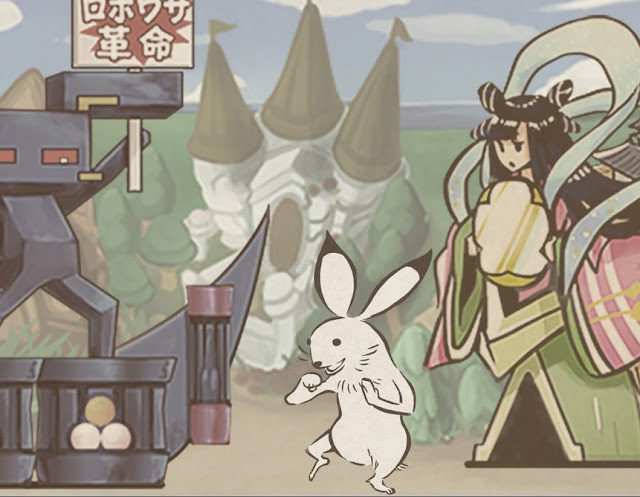 Not that it really matters either, because the real point of the game is that provides fun nonsense that plays around with Japanese art. And Chōjū Giga Wars achieves that admirably. Character designs get progressively weirder the further you play, and they come at such a rate - I found myself playing on, and on, because I was looking forward to what new craziness I'd see in the next level. Once you're a dozen or so levels in, the screen really explodes with all kinds of weirdly creative stuff, and as downright surreal as it all is, it somehow works. I don't know how the developer managed to sustain it over as many levels as it did, but it did. As I said at the start, I would be incredibly surprised if we see Chōjū Giga Wars ever localised into English. 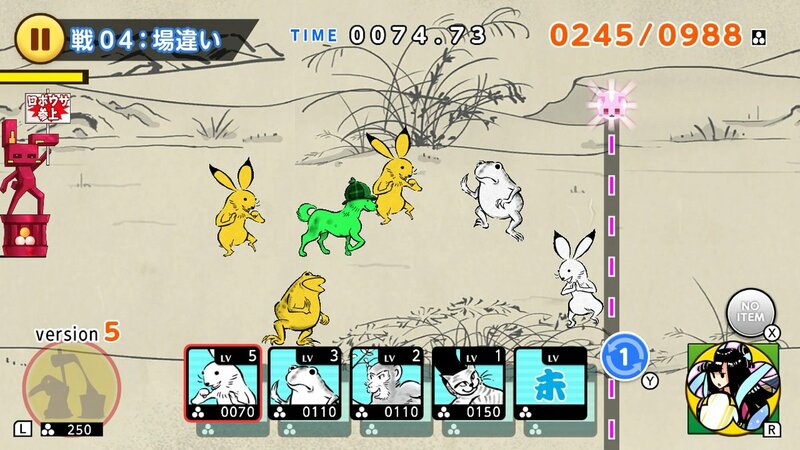 Far too much of its sense of humour rests far too heavily on players understanding a lot of very Japanese-specific humour. But now, thanks to this article, you're on board with all that, so please do play this one. It's such a delight (and once you're in the game itself it's all completely playable without understanding a whit of Japanese).